…and sometimes find yourself giving up on a reading when you want and need its help, then this is for you. Looking back through my own handwritten journals from the 1990s, I see a fair sprinkling of ‘aha!’ moments – I’d never have persisted without them, of course – but also a lot of entries that tail off into ‘??! ?’ – where I never really grasped what the reading was telling me. My journal now, by contrast… still has plenty of ‘??!?’. But they’re at the beginning of the entries, not at the end. Then come specific questions, and – eventually, as I let my intuition respond – the understanding. The one important change between then and now is that I’ve learned the questions to ask and which elements of the reading will show me the answers. This sounds simple – it is – but it makes all the difference, and it’s something you can learn. What you need to have in place to start building a relationship with the oracle: a good translation, a Yijing journal, and the means to cast a hexagram. This is the invisible obstacle: often, what seems to be an interpretation problem is really a confusing-question problem. Probably the single most important element of confident reading: really experiencing the connection between the Yi’s imagery and your question. No matter how complex a reading gets, you will always be using that inner touchstone. So we have several weeks to build confidence in that – starting with something as simple and elemental as the trigrams. 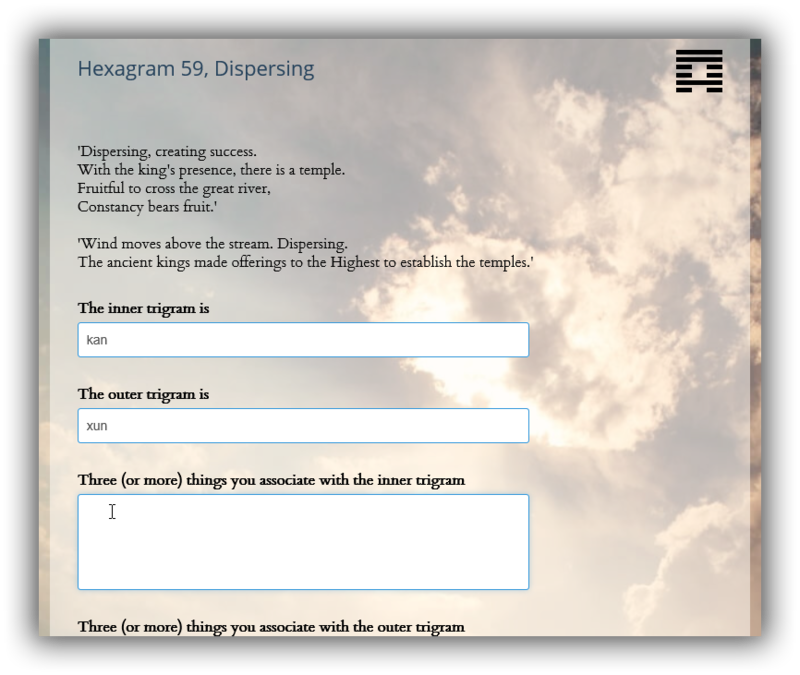 Developing the skills of connecting to and applying a reading, and getting a feel for a hexagram as a whole – through both ancient text and component trigrams, together. – understood through both line positions and steps of change, so you can handle multiple moving lines without confusion. Different ways you can integrate readings as part of your life and keep growing a strong working relationship with the I Ching. Absorbing the material in all three ways – watching, listening and reading – helps it to ‘stick’ in your mind, so the information’s there when you need it. 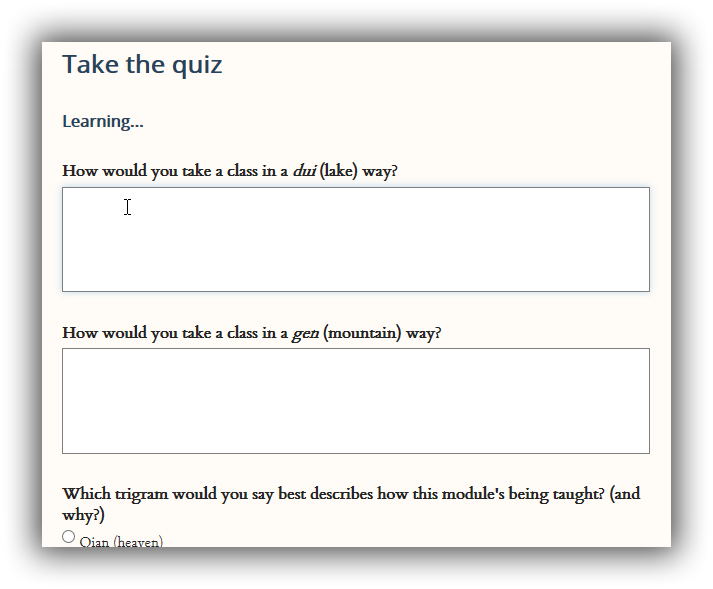 There’s a variety of suggested experiments, quizzes, exercises, and ways to apply what you’re learning. (Which is important, because information without experience is just an unopened book – and, since it’s all digital, not even useful as a doorstop…). I’ve included answers and extensive worked examples for comparison. In the ‘Downloads’ section for each module you’ll find the complete text as a pdf ebook – and also often additional reference guides and worksheets and templates that provide a straightforward, step-by-step way to apply what you’re learning to your own readings. 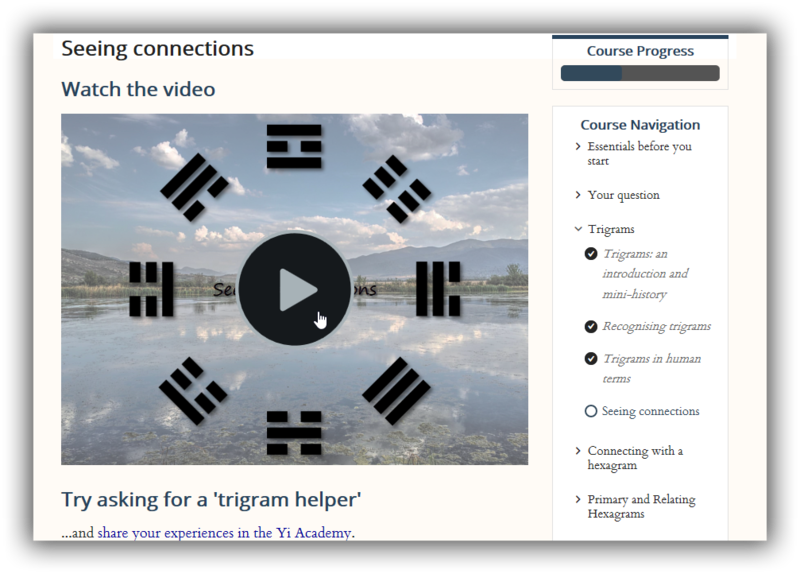 As a Change Circle member, you have ongoing access both to the Yi Academy forum for feedback on course assignments, and also to Reading Circle for support with readings as you integrate what you’ve learned. If – for any reason and at any time – you aren’t happy with the Foundations Course, please just tell me, and I’ll give you your money back without question or fuss. …then you’ll receive immediate, lifetime access to the full course – 7 modules with video, audio and ebook versions and supplementary reference materials, and suggested ‘assignments’ and things to try for each module. Because this is basically a digital product, the EU requires that I charge VAT on the purchase to all EU residents. (That’s why the order form requires your address even though there’s nothing to post.) So the course costs £75 (about $98 or €87) plus any VAT chargeable where you live. Click here to order the Foundations Course on its own. As soon as you sign up for mentoring, we’ll arrange a time to talk, and discuss your relationship with Yi, what you’re looking for from the course and how I can help. Then each time you complete a module assignment, you can send it in to me, and we’ll talk it through. I’ll be able to help you directly with interpretation and show you how to access your own natural understanding of a reading. There is no time limit to this: you can go through the course at whatever pace you choose, and send me your next assignment whenever you’re ready. You could complete the course in a couple of months, or spread it out over a few years – either is fine. The Foundations Course with Mentoring costs £50/month (about $65 or €58) for 12 monthly installments, or you can make a single payment of £500 (and save £100). If you want to access the Foundations Course by itself, click here. If you want to sign up for the Foundations Course with individual mentoring, click here. Or to access the Foundations Course as part of Change Circle, click here. I think your course is AWESOME! It contains all the brass tacks needed for better interaction with Yi. I came to the course with basic knowledge, having used Yi for years already, but came away with a much more profound understanding, and also, your book is very nice, and it’s become my go-to Yi Ching book. The Foundations Course is very well put together. I watched the videos, but haven’t listened to the mp3s yet. I plan to refer to the .pdfs in the future. All in all, good to have the different formats, for different learning types. The trigrams and their directions were the juicest part of the course for me, but I can’t think of any one thing more useful than another – all of them were! – and I now approach an I Ching reading in a deeper and more transformational way. Instead of just blindly following an I Ching book interpretation, I can contemplate a while and choose a personal way of understanding my casting. The most useful thing I learned? To be faithful to the actual words, rather than just a sense of them, i.e. that every word/image is saying something important. The structures have been very helpful too, things like the relating hexagram as where I can recognise myself or the lines as layers/story. This helps to ground my reading before my intuition can take off. I also found the trigrams and their qualities useful. Since taking the course, I pay more attention to every word and spend much more time with the image. I pay attention to the voices of the lines. When I have time, I spend more time on the trigrams too. I think I am more confident commenting on other people’s readings. Usually I have found this hard to do. I also feel more trust. I feel less likely to ignore the message, if I get the message in the first place that is. It may sound weird but I feel like my awareness has gone through a doorway and suddenly hears things unheard before, and I understand the language more. The notes were great. I plan to print them all out and make a mini-book, I will return to them frequently. There’s a lot of information there and I will happily keep studying them for some time. The Yijing requires our full poetic attention, from which we make what meaning we can. The Foundations Course illuminates the fundamentals so brightly they catch fire in the reader’s mind. You’ve deepened my enthusiasm for The Classic of Change by clarifying with unerring ease the magnetic components of this ancient divination system, so that now I see better how all the parts fit together as a self-consistent whole. Seeing this deeply into the dynamic structure of theYijing, I feel more confident about participating with the book’s mythopoeic insights into the flow of events carrying my life.